Together, we're PV solar installers with high-standards. A nationwide network of MCS PV solar panel installers that offer industry-leading technologies at reasonable prices. A network of like-minded solar companies. I always spare a thought for MCS solar panel installers who endure the ravages of the British climate - scrambling on roofs and various other precarious positions whilst doing their highly-skilled job. I'd like to hear from any local MCS solar installation companies who offer an excellent service with their solar panels with accompanying reasonable pricing. If this sounds like your business, then please contact me about being listed on our network of trusted solar installers. I have worked to bring together skilled installers with pioneering people who are interested in installing solar panels from the South coast of England to the highlands of Scotland and Wales. Started in 2004, my passion for solar technologies has never waned, but the world's enthusiasm for alternative energy has become more apparent since. "Solar panel installers are heroes. They tirelessly install solar panels in all conditions. I doff my cap to these highly-skilled and hard-working individuals." A guide to a quality solar installation. Tips to help choose a reputable company for quality solar panel installation and peace of mind. 1. Please ensure installers certify as MCS-accredited for technical professionalism. 2. Additionally, ensure a company belongs to the Renewable Energy Consumer Code (RECC). The RECC has codes of conduct relating to sales procedure. 3. Ensure companies surveys you're home thoroughly before giving you a quote. 4. Please don't allow salespersons/surveyors overstay for longer than you're comfortable. The RECC guidelines confirm no longer than two hours. 5. As a consumer, you always have a seven-day cancellation period if for any reason you are unhappy. This guide should help you avoid any unpleasant experiences and help you make a well-informed decision for important technology. Ask any MCS PV solar installer for details. MCS or 'Micro Certification Scheme' accreditation is the benchmark for qualified PV solar panel installers. 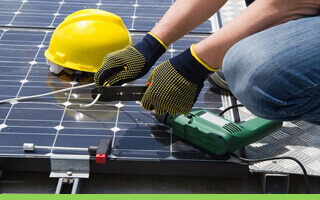 You'll require a full inspection for a quotation, simply because solar panels aren't a one size fits all technology. We all want the highest quality installation, so unsatisfactory or poor performing companies can no longer thrive under the Micro-Generation Certification scheme introduced in 2009. How to become a MCS solar panel installer? The MCS accreditation is a government accreditation to evaluate microgeneration products and their installers. To become an MCS certificated installer or to have your products certificated under the MCS scheme, you must contact MCS directly. MCS solar panels installers require complete compliance with the relevant MCS standard MIS3002. The most pertinent of these are the guides for the installation of PV solar panel systems. Also, MCS is about ensuring quality control, as defined in the MCS standard MCS001. 1. Say what you do (disclose written procedures for scrutiny). 2. Do what you say (follow your procedures as standard best practice). 3. Prove it (Inspections and assessments by approved MCS certification personnel). All our MCS solar installers are RECC scheme (Renewable Energy Consumer Code) members.